The purpose of a Steam Trap is to keep steam in the system while removing condensate (water) and air. Air can reduce the heat transfer ability of steam and cause corrosion. Condensate / Water substantially reduces heat transfer and the ability of a steam device to do work. When a steam trap fails, it allows steam to blow-through along with the condensate. This loss of steam can represent a substantial energy loss. A basic component of all industrial energy audits in plants with steam, is a stream trap inspection and repair/replacement program. 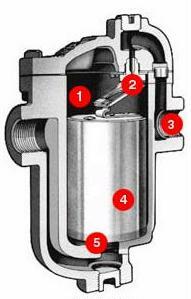 There are several types and manufacturers of steam traps. The most common is the Mechanical Trap. Mechanical traps operate by using the difference in density between steam and condensate. The Inverted Bucket is the most common mechanical trap. The float resembles a bucket (4). Thermostatic traps detect the variation in temperature between steam and condensate at the same pressure. The sensing device operates the valve in response to changes in the condensate temperature and pressure. Thermodynamic Traps use volumetrics and pressure differences that occur when water changes state into gas. These changes act upon the valve directly. For more information on Steam Traps, see the Armstrong International web site. There are also devices that are not really traps at all, but are more like an orifice meter. When properly sized for the application, they can be a cheap alternative, although some steam is lost along with the condensate. 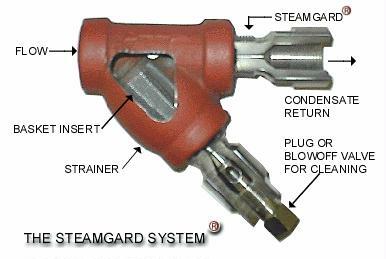 STEAMGARD® uses a nozzle to remove condensate. THERE ARE NO MOVING PARTS. According to STEAMGARD, this design is a new standard, and is classic in the way it redefines condensate removal. “Sizing” of steam traps has to allow for intermittent operation, and they use “safety factors”. Thus, the discharge orifice is often TEN or more times larger than necessary. When the trap fails or leaks, you lose a lot of steam. The size of the Nozzle in STEAMGARD® devices is much smaller. The nozzle design eliminates wear and allows us to design for “two phase flow”. When condensate is present it throttles the steam flow. Both steam and condensate try to flow through the nozzle. The steam’s momentum is almost all in its speed, while the condensate is much more dense. The liquid phase impedes the steam forcing it to slowdown from roughly MACH 1 to the speed of a car. Steam flows a fraction of a lb/hr are normal. Perfectly functioning steam traps are advertised to have steam flows of 2 lb/hr. Failed trap losses can run to hundreds of pound per hour. STEAMGARD® cannot fail open due to its design. Most traps fail in the open mode. When this occurs, at times, a boiler may begin to work harder to produce the necessary energy to perform a task which, in turn, can create high back pressure to the condensate system. This inhibits the discharge capacities of some traps, which may be beyond their rating, and cause a system inefficiency. While most traps operate with back pressure, they’ll do so only at a percentage of their rating, affecting everything down the line of the failed trap. Steam quality and product is affected. A closed trap produces condensate back-up into the steam space. The equipment will not produce the intended heat. As an example, if there are four coils in a dryer and only three are operating, it will take longer for the dryer to dry a product, which will have a negative effect on production. Excluding design problems, two of the most common causes of trap failure are oversizing and dirt. Oversizing causes traps to work too hard. In some cases this can result in blowing of live steam. As an example, an inverted bucket trap can lose its prime due to an abrupt change in pressure. This will cause the bucket to sink, forcing the valve open. Dirt is always being created in a steam system. Excessive build-up can cause plugging or prevent a valve from closing. Dirt is generally produced from pipe scale or from over-treating of chemicals in a boiler. When steam traps cause a back-up of condensate in a steam main, the condensate is carried along with the steam. It lowers steam quality and increases the potential for waterhammer. Not only will energy be wasted, equipment can be destroyed. Waterhammer occurs as slugs of water are picked up at high speeds in a poorly designed steam main or in pipe coils or where there is a lift after a steam trap. In some systems, the flow may be at 120 feet per second, which is about 82 m.p.h. As the slug of condensate is carried along the steam line it reaches an obstruction, such as a bend or a valve, where it is suddenly stopped. The effect of this impact can be imagined. It is important to note that the damaging effect of waterhammer is due to steam velocity, not steam pressure. It can be as damaging in low pressure systems as it can in high. This can actually produce a safety hazard, as a valve or a strainer can be blown out by the force of waterhammer. Condensate in a system is destructive. It can cause valves to become wiredrawn and unable to hold temperatures as required. little beads of water in a steam line can eventually cut any small orifices the steam normally passes through. Wire-drawing will eventually cut enough of the metal in a valve seat that it prevents adequate closure, producing leakage in the system. Before testing a steam trap, inspectors should be familiar with the particular function, review typical types of traps and know the various pressures within the system. This can help avoid misdiagnosis and allow proper interpretation of trap conditions. There are three main categories of online trap inspection: visual,thermal and acoustic. 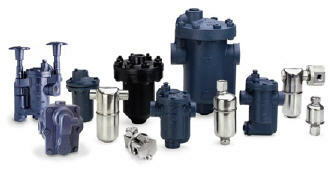 Visual inspection depends on a release valve situated downstream of certain traps. An inspector opens these valves and looks to see if the trap is discharging condensate or steam. Thermal inspection relies on upstream/downstream temperature variations in a trap. It includes pyrometry, infrared, heat bands (wrapped around a trap, they change color as temperature increases), and heat sticks (which melt at various temperatures). Acoustic techniques require an inspector to listen to and detect steam trap operations and malfunction. This method included various forms of listening devices such as doctors’ stethoscopes, screwdrivers, mechanical stethoscopes and ultrasonic detection instruments. The ideal listening device will allow users to listen to the sounds of steam trap operations while ignoring most ambient pipe sounds. This is where ultrasonic listening devices excel. Since they are sensitive to high frequency (short wave) signals, they tend to ignore most stray pipe signals. Also, they are very directional in their pick-up. For this reason, they will allow users to hear and see on meters the exact operations of steam traps. Ultrasonic detectors usually have a stethoscope module, which contains an ultrasonic transducer attached to a metal rod that acts as a “wave guide”. The wave guide is touched on the downstream side of a trap to determine trap condition such as mechanical movements or steam and condensate flow. Most ultrasonic detectors amplify the signals and translate them into the audible range where they are heard through headphones or seen as intensity increments on a meter. Some include frequency tuning to allow users to tune into desired trap sounds. Steam traps that fail open cause a loss of performance and energy. However, when steam traps fail closed, they can cause worse problems. Not only will equipment become flooded with condensate and stop working, in cold climates during the winter season, the equipment could freeze. Frozen coils and equipment can lead to broken coils and equipment. Steam traps can be monitored ‘manually’ with periodic inspections. However, even an ‘aggressive’ program may only check each trap once or twice per year. Paybacks on failed steam trap replacement is often measured in months. The faster a failed trap is discovered the quicker it can be replaced/repaired. Automated monitoring with instant failure reporting minimizes the discovery time and eliminates the labor required to manually check the traps. SteamEye® uses a radio frequency (RF) wireless transmitter mounted at the inlet of any type of steam trap to detect temperature and ultrasonic fluctuations in steam flow. A central receiver then alerts system operators of trap failure. 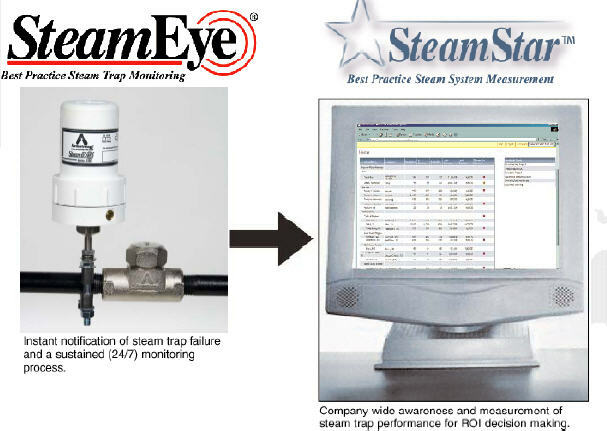 SteamEye technology is constantly on – constantly reporting the status of your steam traps for optimum energy system management and savings. It can be installed on traps in service without shutting off the steam, and its remote, wireless operation addresses the labor costs and safety issues associated with manual monitoring. The typical range of the RF signal is approximately 1,200 feet in outdoor applications where the transmitter is located within the receiver’s line of sight. 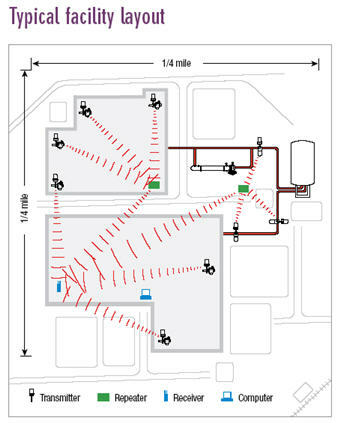 In facilities where the signal must travel through walls or floors, the range varies. The typical range of the signal is approximately 300 feet. If the receiver is out of range of a transmitter, repeaters can be placed between the transmitter and the receiver to “repeat” the signal from one device to the next. SteamEye® automatically updates SteamStar™, Armstrong’s Web-based application, providing instant validation for continuous trap monitoring. If manual trap surveys are more feasible in certain areas, use SteamStar as a stand-alone application. Either way validates the cost. SteamStar is the only Web-based application that can demonstrate savings while showcasing energy reduction efforts to multiple organizational levels. It lets an organization evaluate energy savings locally, as well as at sites around the world. The data is safe, secure and accessible – any place, anytime, anywhere.